In really great recipes, the flavor and consistency of the ingredients just naturally complement each other. This recipe is one. 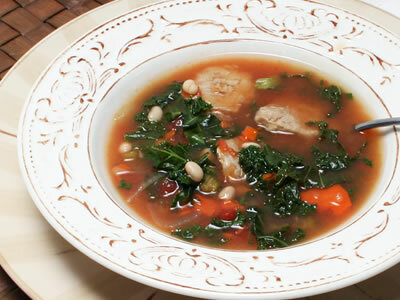 The buttery white beans, the lean but substantial chunks of pork and the earthy flavor of the greens combine to provide a balanced and satisfying soup. Pork is popular in China and Europe. By 5000 BCE pigs were domesticated in many parts of the world. Columbus even took pigs on his voyage to the Caribbean island of Hispaniola in 1493. The pork in this recipe - the tenderloin - is leaner than many other cuts, so the fat and saturated fat levels are moderate. The onion, celery, carrots and tomatoes provide a great garden vegetable base, but kale is the real star. Kale blends nicely into the soup, though it doesn't wilt and cook down as much as other greens. The flavor is powered by the garlic, paprika and red pepper. Although you can use regular paprika, the smoked variety provides the soup with a pleasing Spanish flair. Some chefs like to squeeze a bit of lemon juice or add a dash of apple cider vinegar into the soup to further enhance its flavor. For additional flavor, you can also shred a very small amount of pecorino cheese to top off the soup before serving. The best way is to experiment to see what pleases your taste, but it is great even without the added acidity of the cheese. Heat oil in large pot over medium-high heat. Add pork, season with salt and pepper, and saute until browned, about 3 minutes. Transfer to plate and set aside. Add onion, celery and carrots and saute until soft and beginning to brown, about 3 minutes. Add garlic, paprika and red pepper, and saute about 1 minute. Stir in tomatoes. Add broth and bring to boil. Add kale and gently stir until it wilts. Reduce heat. Stir occasionally until kale is tender, about 4 minutes. Stir in beans and pork and simmer about 3 minutes. If too thick, add a small amount of water.